We started the development of gravimetry using helicopter in 1998 and attained a preliminary success in gravity measurement in 2000. For this purpose we have manufactured a new gravimeter (SEGAWA Model) with a servo accelerometer as a gravity sensor and an optical fibre gyro to keep vertical. Our success owes mainly to precise positioning of helicopter, and delicate correction for the effect of helicopter’s horizontal acceleration. We have so far conducted test and/or practical measurements by helicopter (mostly using Bell 412). The advantages of a helicopter over a fixed-wing aircraft in gravity measurement is the high resolution of gravity anomaly obtained because of low altitude flight and low and stable flight speed. The main objective of the measurements is to get continuous profiles of gravity anomalies in the land-to-sea boundary zones, so that gravity void or data discrepancy across coastal zones may be removed and that the active seismic faults running across coasts, which are reflected on gravity anomalies, may be retraced as far as the sea floor. 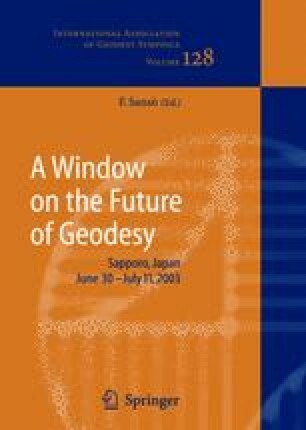 In this paper two results have been selectively described: One is the result of measurement conducted in April 2000 along west-to-east tracks from Saitama to Kashima-Nada Sea, which has disclosed inconsistency between land and marine gravity. Another is the result of survey along the east-to-west tracks in the Enshu-Nada Sea (Tokai area), which shows the changes of free air anomaly and/or gravity disturbance from the coast to the sea floor associated with active seismic faults.